Google I/O 2013 is less than a week away, and the full session schedule - featuring 34 Android sessions (and 3 codelabs) - is now available. We have great Android content spread across three packed days - covering everything from design, development, and distribution. Not everyone can come to San Francisco to join us in person, so we’ll be streaming a selection of the best content as part of Google Developers Live. In addition to the keynote and four session streams (including one dedicated to Android), you’ll see one-on-one product deep dives, executive interviews, and Sandbox walkthroughs broadcast from the GDL stage at I/O. 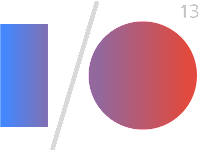 All the live feeds will be available on the Google I/O homepage from the comfort of your own home - or join our Google Developer Groups to experience Google I/O as part of Google I/O Extended. Whether you’re attending in person or virtually, you can follow all the action using the official Google I/O 2013 conference companion app! 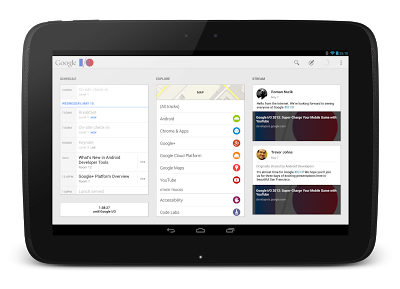 It supports devices running Android 2.3+, and is optimized for phones and tablets of all shapes and sizes. Use it to view the conference sessions agenda and create your own personal schedule with reminders, view details on sessions, code labs, office hours, and speakers, track announcements, and even view the keynote and live streamed sessions throughout the conference! If you’re attending in person, you can use it to guide yourself around the venue using the vector-based conference map, Android Beam session details, scan fellow attendee badges, and provide feedback on the sessions you watch. And stay tuned after I/O when every Google I/O technical session will also be posted to GDL and YouTube, and the conference app will be open sourced.